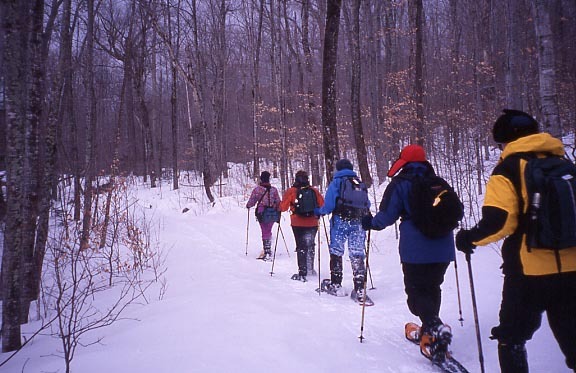 Trek into the wilderness this winter with your new-found snowshoeing skills. Our instructor will go over picking the correct snow shoe for you, avalanche awareness, maps, places to snowshoe, weather, the best way to dress as well as the fitness component of snowshoeing. Don't spend another winter indoors! Join us to learn this fun winter sport. $35 per class. Note: If you like this class, you can also take our Snowshoe Adventures class in January and February (see below). Pre-requisite: Snowshoeing Class - see above (unless authorized by instructor). Now that you know what your doing, test you're new-found skills in a real snowshoe adventure. This half-day trip will consist of 1.5 to 3 miles of snowshoeing and 800-1500 ft of ascent. The snowshoeing location will be decided within the week of the trip, weather permitting. When registering for this class, please make sure to list your email address so we may contact you with a meeting location. $25. A list of needed supplies will also be emailed, or you may call 385-646-5439 for this information. CLICK HERE for a list of companies that rent out snowshoes and other snow equipment. CLICK HERE for a list of the best trails to go on, or you can ask the guide when you rent your snowshoes for a map. Many ski resorts will also have information on snowshoeing.